Well, it’s the time of the year to try and find the perfect gift for those outdoor adventurers in your life. If you are thinking, ‘What’s a good gift for an outdoorsy person?’, then let us help you. We’ve asked our team for the best outdoors-themed gifts, and here is what they want! #1: The Best Underwear Ever! It’s amazing, but not everybody realizes how incredible great underwear is. Remember the first time you tried 800-thread count sheets? That’s the experience when you try good underwear for the first time. We love two brands. 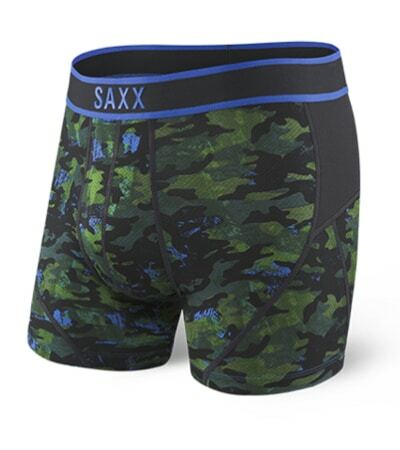 For Men we love Saxx Underwear. OK, we only discovered SAXX this Autumn, but the Kinetic boxer-briefs are incredible! Keep you loved ones safe this winter with a gift that teaches them how to be safe in the outdoors in winter. We love avalanche training, as it’s one of the few education opportunities you can do on snowshoes or skis! It’s also a fun way to meet other people while also learning about safety.  Check out this resource put out by the American Institute for Avalanche Research and Education, showing which avalanche courses are being offered all over the USA. It seems most outdoors people usually have another passion in life: Coffee. For some outdoors lovers any coffee will do, for others it is a religion. In the backcountry (or even on camping / hotel trips) we often had to sacrifice on our coffee in the past. How many more Mr. Coffee’s will we drink. Hopefully not many more. We bought the ultra-light AeroPress for home use last year, and quickly realized it was a great option for the outdoors as well. Pair this with some great, freshly ground beans and you’re going to be in your happy place real soon! The Aeropress punches way above it’s weight and cost. In fact, we’d take this over a lot of high-cost espresso machines! But great coffee isn’t the machine. It’s the beans! We love local, freshly-roasted coffee, ideally recently ground in a burr-grinder. Think of coffee like bread: the closer you drink it to when it was roasted / baked the better. Try and find a great local roaster and pick up a pound or two for your loved one. If you can’t be bothered finding something local, we have subscribed to Bows & Arrow 3-month subscription in the past and loved the coffee! What a wonderful surprise to get some great fresh beans every month! Many of us assume that when snow comes the hiking season is done. Don’t let this be the case, and extend hiking into the winter with Microspikes. We like the Kahtoola Microspikes and you’ve probably seen the distinctive red spikes on trails before. 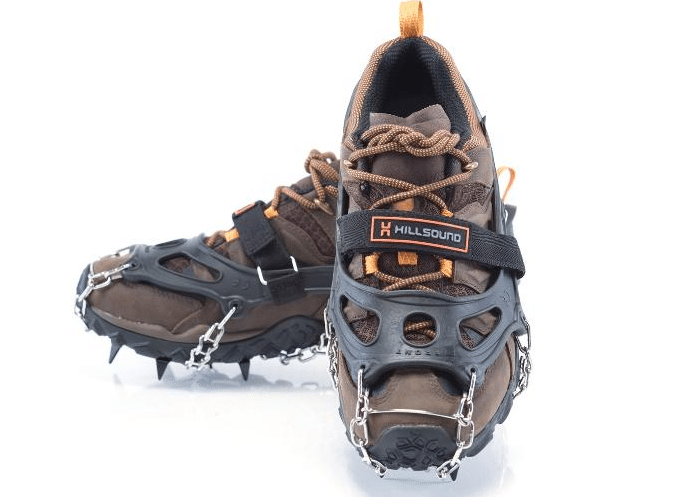 We are also hearing great things about the Hillsound Trail Crampons, especially the Velcro strap that keeps them in place. Best to pair this gift with an Avalanche course, as winter can be a dangerous place! Reading is what many of us outdoors adventurer do when we are tucked into our sleeping bags at the end of a long day. Yes, people still read books. Many of us don’t want to lug a heavy book around with us. The answer is a Kindle. We love the basic Kindle from Amazon. Not only is it cheapest, but it’s also the lightest weighing under 6 oz! We can have dozens of books at our fingertips with a kindle. Once you’ve got a kindle, you may want some book ideas. You can’t go wrong looking at Alastair Humphrey’s book list. He doesn’t toot his own horn, but we can heartily recommend his books about spending 5-years cycling around the world. The first book, Moods of Future Joys, will keep people in a comfy chair reading through to New Years! The second half, Thunder and Sunshine will get them through the short days of January! Spending a lot of time outdoors usually means less time in the shower or bath. We know, our clothes can get pretty stinky after a weekend in the backcountry. In the past, smelling bad was just part of the life of loving the outdoors. Thankfully, there is an answer: merino wool! Somehow it doesn’t get smelly. So much that all of our active and travel t-shirts and long-sleeve zips are merino wool. Thankfully, Icebreaker has made gift-buying easier for us this year, with a Men’s Gift Guide and a Women’s gift guide! It gets cold in winter in the mountains. But with the right gear you stay nice and toasty! Consider buying an insulating layer or two for your loved one this winter. We really love supporting Patagonia. Not only do they make great gear, but it seems to last forever. They also really support taking care of the outdoors. Darn, they’re a great group of people. Did I mention they also have the best sales on outdoor gear on earth each year! 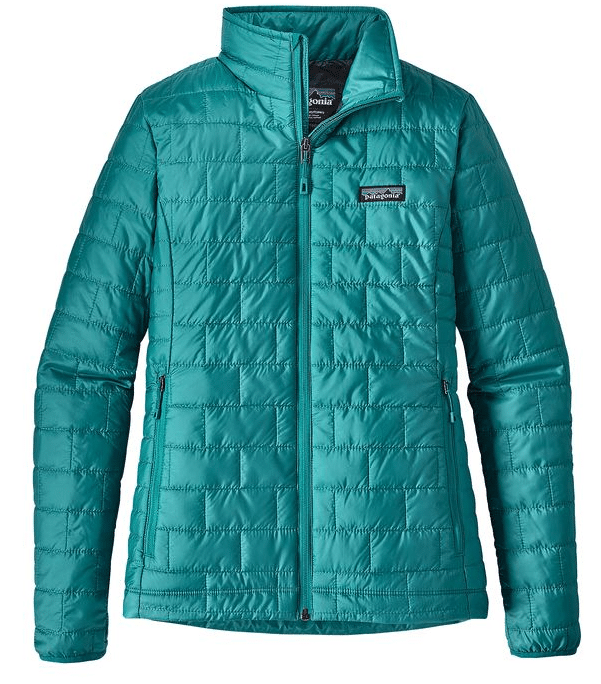 This winter we love the Women’s Nanopuff Jacket. Using synthetic down, this jacket is great as it can get wet and still provide insulation! They’ve also got a Men’s Nano Puff as well! We wear the Nano Puff vest almost daily now! We spend a lot of time on the road and out in the mountains. Some of our favorite times have been listening to Audiobooks, Podcasts and music. In fact, music is a strong part of our memories from our expeditions. Whether it is having The Album Leaf put us into a meditative state in a hut after a long day skiing through a whiteout on the Wapta Traverse or coming down from the Col D’iseran on France’s GR5 hike having Mogwai getting us pumping our arms and jumping in the air. It’s clear that music is an integral part of being in the backcountry for us. So make sure you have great headphones to enjoy your music. We love these Bose Headphones, but make sure you get the ones for your device, there are different headphones for Apple vs. Android. Even better, the Green ones are on sale now on Amazon! A lot of us have so much, that more stuff isn’t necessary. In fact, it seems we take more ‘stuff’ to goodwill every few weeks, as we attempt to get rid of the mountain of stuff we already have. It’s crazy, but life seems easier with less stuff (as long as the less stuff is good stuff, that is!). So, this winter consider finding a great charity that supports the outdoors and make a donation instead of buying somebody more stuff. Whether it’s an Alpine Club, a local outdoors group or an organization working to keep the wild parts of our earth wild, help them out with some cash. We love the Nature Conservancy, and have donated to the Nature Conservancy of Canada many times. We also like to support the Alpine Club of Canada. Make a great picnic and head-out for a dayhike or XC ski. Plan a mountain weekend full of outdoor adventures, laughs and great food. I hope we shared some of our favorite ideas here. We hope you have a wonderful Christmas and manage to get outside and share adventures with your loved ones! P.S. Some of the links we shared earn us a small commission. These small commissions help to fund our website, and don’t change the price you pay. Know that what we share is only stuff we love. Whether we earn a commission or not doesn’t influence what we list!